Tantalum Nanoparticle Dispersions are suspensions of tantalum nanoparticles in water or various organic solvents such as ethanol or mineral oil. American Elements manufactures metallic nanopowders and nanoparticles with typical particle sizes ranging from 10 to 200nm and in coated and surface functionalized forms. Our nanodispersion and nanofluid experts can provide technical guidance for selecting the most appropriate particle size, solvent, and coating material for a given application. We can also produce custom nanomaterials tailored to the specific requirements of our customers upon request. See more Tantalum products. Tantalum (atomic symbol: Ta, atomic number: 73) is a Block D, Group 5, Period 6 element with an atomic weight of 180.94788. The number of electrons in each of tantalum's shells is [2, 8, 18, 32, 11, 2] and its electron configuration is [Xe] 4f14 5d3 6s2. 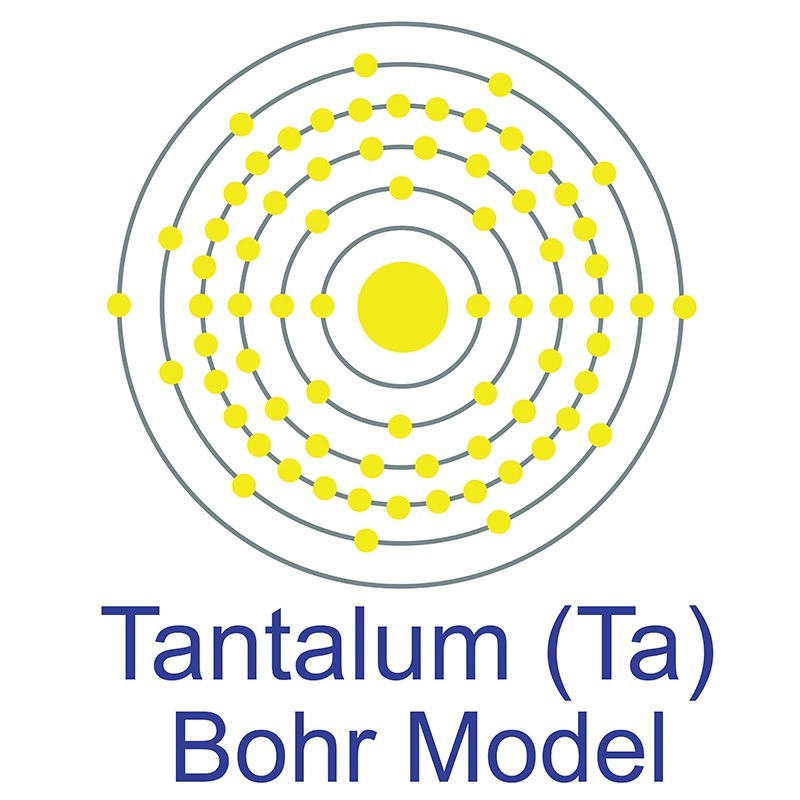 The tantalum atom has a radius of 146 pm and a Van der Waals radius of 217 pm. Tantalum was first discovered by Anders G. Ekeberg in 1802 in Uppsala, Sweden however, it was not until 1844 when Heinrich Rose first recognized it as a distinct element. In its elemental form, tantalum has a grayish blue appearance. Tantalum is found in the minerals tantalite, microlite, wodginite, euxenite, and polycrase. Due to the close relation of tantalum to niobium in the periodic table, Tantalum's name originates from the Greek word Tantalos meaning Father of Niobe in Greek mythology. American Elements assists our Tantalum customers with fulfilling the due diligence reporting requirements of the Conflict Mineral Provision (Section 1502) of the Dodd-Frank Act. Significantly enhanced osteoblast response to nano-grained pure tantalum. Kinetic Growth Regimes of Hydrothermally Synthesized Potassium Tantalate Nanoparticles. Fabrication of nano copper oxide evenly patched on cubic sodium tantalate for oriented photocatalytic reduction of carbon dioxide. 0D/2D Z-Scheme Heterojunctions of Bismuth Tantalate Quantum Dots/Ultrathin g-CN Nanosheets for Highly Efficient Visible Light Photocatalytic Degradation of Antibiotics.